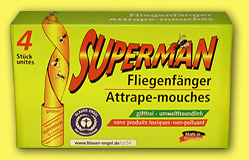 The SUPERMAN glue tape flypaper is a well-tried, reliable and absolutely non-toxic product against house flies and fruit flies. The glue is made of natural products, without addition of insecticides. Free of biocides! Pull the lukewarm flypaper out of the tube by turning it gently at the red band and leave the tube on the tape. Fasten it to the ceiling with the enclosed drawing pin. 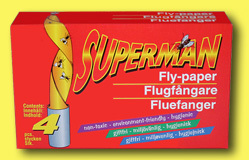 Wrap the used flypapers into paper and throw them to the household waste. Direct sunlight or draught will reduce the adhesion. Keep the flypaper away from children and pets and don’t hang it within their reach. Free flying birds might get caught on the glue paper. 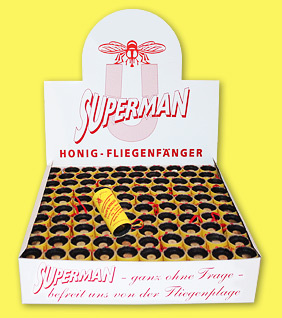 According to the room size it might be necessary to apply several flypapers. Possible glue stains can be removed with cooking oil. The glue is not water-soluble. Store the glue paper dry and cool.